GURU DUDU Gave me Fringe Fever!!! I just had my most amazing Fringe experience – EVER!! In fact, it was so amazing, I couldn’t get to my social media sites fast enough to spread the word. Facebook, Instagram, Twitter, Yelp! Must let the world know: GURU DUDU is the best!! This show is advertised as ‘Guru Dudu’s Silent Disco Walking Tour’ but this isn’t any ordinary walking tour. Guru Dudu isn’t a ‘Tour Guide’ giving us facts and figures – he’s a ‘Conductor’, orchestrating total strangers into a cohesive group of singers and dancers. The twist? Only we can hear the music and his verbal instructions through our headphones. People on the street can only see us dance and hear us sing a cappella (that must have been painful at times!). My night didn’t begin as planned. A few hours before the show, as I was squeezing into my silver lycra and sequined bolero, my buddy cancelled. I stuck silver stars (and a smile) on my face and bravely decided to go it alone. When I got to the Grassmarket, I realised I was the only one (besides the guru) in fancy dress but once I donned my headphones, none of that mattered! Guru Dudu gathered us ’round and warmed us up with his unique style of ‘Happy Yoga’. Not only did we warm our muscles, we loosened our inhibitions, and shook up our funny bones! We shuffled around and shared dances with lots of different partners. As I mixed and mingled with total strangers of all ages (from a wee girl of about 10 to feisty over 60’s) any fears I had about coming alone vanished. Within minutes we were ready to take the show on the road! It was absolutely fantastic to see everyone totally getting into the spirit of the moment. Nobody was shy, nobody held back, nobody wanted to stop and my ‘disco gear’ even got a special nod of approval from the Guru himself! With the music playing dance tunes, Guru Dudu led us up from the Grassmarket, up Victoria Street and up the steps to the Royal Mile. The police had the road cleared for the Tattoo and were happy to let us take full advantage of the blocked off road. Tourists gathered on the side of the road, thinking they were seeing a real show; never guessing that we were the audience! The Guru’s verbal cues and the natural rhythm of the music had us dancing as one. He managed to co-ordinate our movements so that we looked as we had been rehearsing together for months. I thought to myself, this is what the fringe is all about. Letting go of inhibitions. Putting on fancy dress. Not caring what others think. Not afraid to make a fool of yourself. Singing aloud to a sound track that you forget no one else can hear. My thoughts were interrupted by instructions coming through the headphones. “See that lady on the left, in the pink jacket? Point and gather around her”. As we moved towards her I realised – she can’t hear him! She had no clue what was happening! Luckily the crowd were just as open minded to the experience as we were. And I think they were happy to catch a Flash Mob in the making. In fact, at times I was a bit jealous of the on-lookers. It must have been pretty cool to be walking down the street and suddenly 50 people appear out of nowhere singing the same tune and dancing like they were from the cast of ‘Fame’. We moved along the Royal Mile, taking centre stage, claiming our 15 minutes of fame. Other street performers either gave us space or joined along. We did a line dance. We mimicked strangers. We had a sing-off. We played air guitar. All totally spontaneous; all totally from the heart. I don’t want to give too much away, in case he uses the same songs in other shows, but I will say that it was brilliant fun and I hope to do it again. In fact, if I could afford it, I would do it every day!! Guru Dudu gave me the chance to experience total freedom of expression and it was liberating! Exhilarating! I felt like I could sing louder and dance without limitations. I am now totally up for the rest of my Fringe 2015! I’m open for even more new experiences. Ready to learn, to laugh, to cry, to explore, and hopefully to once again dance like nobody’s watching! Follow along with all the antics over on Guru Dudu’s Facebook page or head over to the Fringe Website to book tickets and join in with the fun. I also recommend checking out the performance times and going along to watch – it starts in the Grassmarket – then just follow along to see what happens! I’d also like to give Guru Dudu special thanks. You may have noticed that I haven’t been writing many posts lately. Lots of holidays and travel and life in general has gotten in the way and created a bit of a writer’s block. But, as soon as I got home from the Silent Disco, I was straight on my laptop writing about my fab experience. 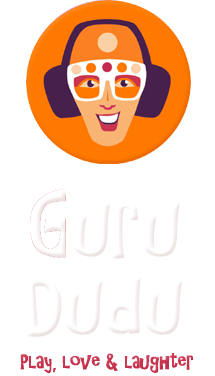 So, thanks Guru for giving me my blogger’s Mojo back!